This elegantly accented collection takes traditional old English styles and merges them with rustic wood curvatures of an Aztec feel. A richly beautiful collection of formal living room furniture, this sofa, chair and ottoman group will add a bold accent to your home. 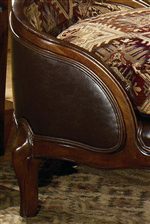 Matched fabrics meet with queen anne legs and small bun feet, encased by elegant wood carvings or welt cord trims. 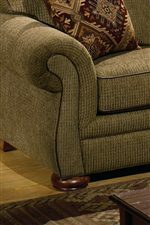 The perfect collection for accent or antique living room furniture, this set will remodel your home the instant it arrives. Browse other items in the 2670 collection from AHFA in the area.